It seems that people approach grilling steak one of two ways: either in a casual manner or paying perhaps too much attention. 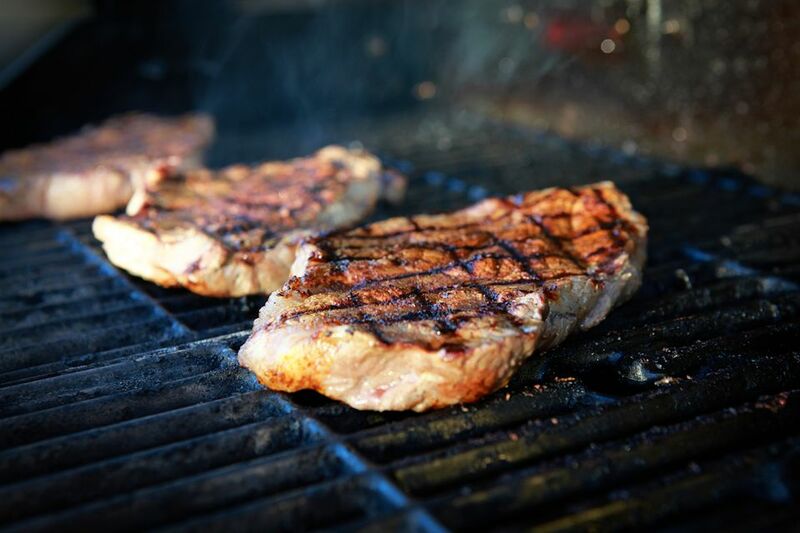 Some will heat the grill with abandon, throw the steaks on, flip once, then pull them off, and serve; others will fret and worry, cutting into the meat every two seconds wringing their hands over whether the meat is done or not. Both techniques do have some merits but a method somewhere in the middle is ideal. Grilling a delicious steak is easy, as long as you follow a few simple steps. As with anything, a bit of practice always helps, too. Follow some advice, grill a few steaks, and you'll be serving up perfectly cooked juicy steaks in no time. Too many people take their steaks directly from the chilly fridge to the hot fire. You will not get an evenly cooked steak this way—the outside of the meat will cook faster than the inside. It is best to take the steaks out of the fridge about half an hour before you plan to cook them; remove the wrapping, place on a plate, and let them come up to room temperature on the kitchen counter. A good piece of meat doesn't need a lot of seasoning and will be quite delicious with a generous sprinkling of kosher salt. Once the steaks are at room temperature, sprinkle with salt or another seasoning of your choice. No matter what you are grilling, you should always begin with clean grill grates. Not only does this make it easier to flip and remove the food from the grill but it also does not impart any flavors from previous grilled meals, such as barbecued chicken, into the steaks. Make sure to clean your cooking grate using a stiff wire brush. 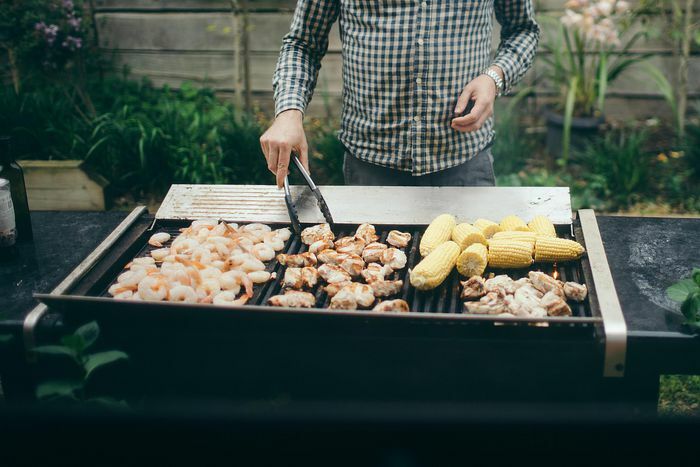 It is best to do this after you've finished grilling while the grates are still warm, but you can also clean the grill while it is preheating if you discover caked on residue. Taking the time to brush off old bits of cooked-on food will pay off handsomely when your steaks release from the cooking grate with ease. You also want to coat the grates with vegetable or canola oil (or other neutral-flavored oil) before heating the grill. Pour a little bit of oil on a paper towel and rub onto the clean, cold grill grates. To achieve a crust on the outside while keeping the interior of the steak cooked to your liking, you need to have two different temperatures set on your grill. In order to get those nice grill marks, you need to heat your grill to high heat to essentially sear the steaks. To determine the heat is hot enough, you should be able to hold your hand about an inch over the grill grate for 1 second before it feels too hot and you must pull it away. You also want a cooler, medium heat area of the grill to move the steaks to once they're seared and crispy on the outside. If you have enough burners and space on your grill, set them to a lower heat; if you don't have enough room, simply turn off the burner. If you are using a charcoal grill, one side should have a hot fire while the other a smaller, cooler flame. If you are cooking very thin steaks, they will only need a short time over high heat. Chefs and the cooks who know their way around a kitchen (or a grill) know how meat feels when it's raw and when it's cooked. The only way to learn this is to basically poke the steaks at different stages of cooking. Raw meat is almost squishy, rare meat is quite soft, medium rare meat resists your poking a bit, and medium meat springs back. Once meat feels firm, it's at least well done, if not completely overdone. Gently press a finger onto your steaks—being careful not to burn yourself—to teach yourself the difference. Yes, you should touch the steaks to test for doneness, but that doesn't mean that you should be flipping and moving and poking a lot. Steaks should only be flipped once, and only moved once from a higher to a lower heat. And don't poke them with anything but your finger! Put the meat on a hot grill—they should sizzle immediately—and leave them there until they release on their own accord. If you're pulling or struggling with them, they are not seared and not ready to flip. Once ready, flip them once and cook until they feel done. Do not stab them with a fork, which will release their flavorful juices into the flames below. Do not press down on them with a spatula. Just let them cook. Whether you are cooking a thick steak or a flat, thin cut of meat will determine whether you need a meat thermometer or not. For steaks that are at least 1 1/2 inches thick, you will want to use a meat thermometer to get an accurate reading. For rare, remove steaks at 120 F to 125 F, medium rare 125 F to 130 F, and medium 130 F to 135 F.
It's nearly impossible to get an accurate temperature read on steaks thinner than 1 1/2 inches so it is best to use a timer instead. For 1-inch thick steaks cook them 3 minutes each side over high heat for quite rare, 4 minutes each side for medium rare, and 5 minutes for medium. Try to avoid this if you can, but if you just have to take a peek, remove the steak from the grill and use the tip of a paring knife to make a cut into the center of the steak to see how things are going. Keep in mind that the steak will continue to cook as it rests after being removed from the grill. Cutting into the steak is discouraged because it will release the precious juices that help flavor and tenderize the meat. Perhaps the most important step that most people don't do is allowing the steaks to sit once they are taken off of the grill. The steaks need to rest for 5 to 10 minutes before serving or cutting them. This gives the juices a chance to redistribute throughout the steak, which both helps it finish cooking evenly and keeps the meat moister and more flavorful. Place the cooked steaks on a cutting board or platter and tent loosely with aluminum foil. Once rested, either slice or serve the steaks whole. What Are Some Tips for Using a Gas Grill?